CEREC is our sophisticated, computerized system for producing the highest-quality, precisely designed restorations. It’s used to create veneers, fillings and crowns. Its efficiency enables us to complete these procedures in a single appointment right in our practice. You can walk into our office with a broken or chipped tooth and leave with a complete restoration. We don’t have to outsource these services to a lab because we provide them onsite in our Wilmington office. Even better, our CEREC technology means there’s no need to use temporary crowns or “goop” trays to create impressions. It provides tooth-colored fillings, eliminating the need for “silver” metal ones. 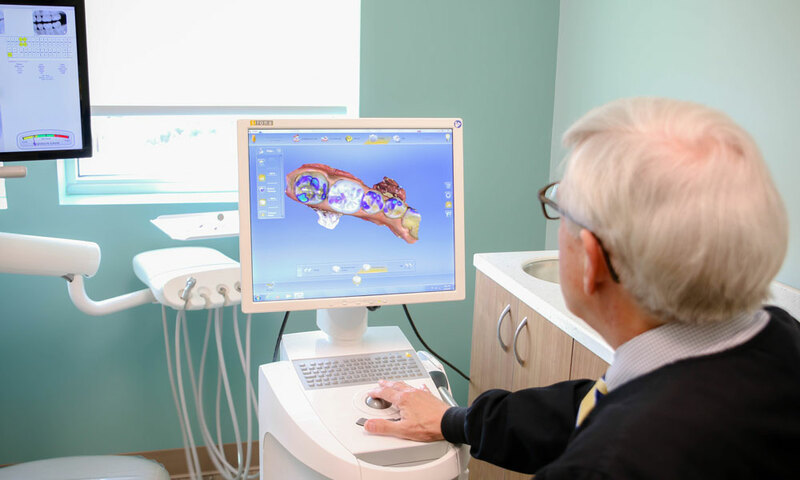 CEREC is a fascinating, clinically proven service—millions have been done worldwide. Replacing a tooth, creating a crown or producing veneers is a simple five-step process. We remove any cavities or the damaged filling. If we’re creating veneers, then we prepare your teeth for placement. The CEREC takes a three-dimensional photograph of your tooth. We use the CEREC to carefully design the contours of the ceramic restoration to perfectly match your tooth. The CEREC automatically mills the restoration out of a tooth-colored ceramic block. The restoration is inserted into your tooth. It looks and feels like your natural teeth.